I’m a shopaholic. At least I was a shopaholic, especially when it came to bargain shopping. For the majority of my life, I never stopped to consider if I truly needed a purchase – if an item looked great, was a desirable brand, and it was an amazing bargain, I bought it. Then God started turning my world upside down with all sorts of realizations about stewardship and my excessive amount of belongings. Bargains or not, I had spent money entrusted to me by the Lord on stuff. Stuff that doesn’t last. Clothing happened to be a big part of that stuff that doesn’t last. And even though I only shopped for bargains – and had even switched over to shopping for clothes at thrift stores – I still had too much. I had squandered our money on clothing. So in January I declared a self-inflicted clothing fast. I wanted to take it in 3-month increments, just to see how everything went. Oh.My.Goodness. I’ve changed so much in a half a year. At first, it was difficult. I realized exactly how much I turned to retail therapy. If I was given a free evening after a rough day, it was fun to mindlessly wander the aisles of a store. The problem was, whenever I thought I was just window shopping, I found myself thinking of potential purchases more. I was more likely to be discontent with what I had – just because I was accustomed to browsing whatever I didn’t have. So I stopped going to stores. My weekly shopping trips were limited to grocery stores, and even then I began splurging on good grocery deals I found. To try to curb my tendency to overshop, I’ve now limited my grocery store runs to about two times a month. I’m glad I went cold turkey when it came to shopping for clothes. It took a couple months to break out of my thought patterns – and finally, I could walk into a clothing store and actually look at clothes on the rack. I was a little nervous when cute spring and summer clothes hit the stores, because it’s typically a tempting time to freshen up your wardrobe. Fortunately my friends and I held a clothing swap, so I was able to boost my wardrobe for free – all while recycling. For the record, I only intended to use my clothing fast on my own clothing. I have two young children who outgrow clothing at a lightning fast rate, so I’m always on the lookout for good bargains. (End of the season clearance sales, anyone?) But once I started consciously thinking about my own purchases, I realized that I don’t have to go overboard on my children’s clothing. Once the first three months of the fast went by really quickly, I decided to try another three months. Could I go six months without buying clothing? No. This spring I found a cute skirt that I thought would be perfect for the summer – and it was $1.99. I couldn’t resist making the purchase, but I feel a twinge of guilt every time I wear it. I was in for a huge surprise, though. When my family was recently vacationing in the Myrtle Beach area, I announced that my clothing fast was over. I had made it for six months without shopping for clothing, and in the past I had LOVED shopping in Myrtle Beach. We were planning a day out, and I was ready to hunt for bargains. I was particularly excited to head to one of the area’s Goodwill stores I read about in Balancing Beauty and Bedlam. I had never ever thought of going to a thrift store on vacation in the past – outlet malls were more my speed – but I was ready to try it. The Goodwill in North Myrtle Beach was amazing. It was large, very clean, and had racks and racks filled with clothing for adults. It was a thrifter’s dream come true. I have enough clothes. I don’t need more. Honestly, I am shocked. 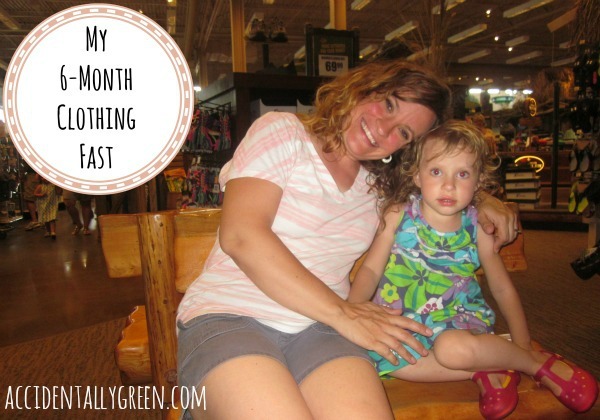 I am shocked that six months of a clothing fast could change my attitude so radically. It’s really important to note that once I returned home and went grocery shopping at my local bargain store, I found some brand-new Target brand T-shirts – in my size – on sale in the closeout section for 99 cents. I bought a white one and a black one, knowing that I’ll get a lot of use out of both shirts in every season. I’m glad I made the purchases, because I think I’ve finally developed a healthy sense of shopping. I don’t feel compelled to go hog wild over clothing that I’ll not wear very often. But if I find a good (OK, amazing) deal on a staple, it’s OK to make the purchase. So I’m going to continue a slightly modified clothing fast for the rest of 2013. I’m going to stay away from stores. And I’m going to avoid making any clothing purchase unless it’s something I really need or know that I will wear quite often. Do you struggle with making too many needless purchases, even if you find great bargains? Do you want to change? How can you start making changes – and when will you start? 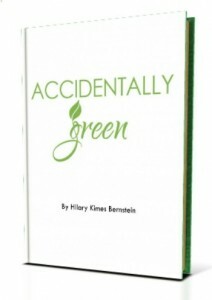 Do you like what you’ve read on Accidentally Green? Don’t miss a post! Sign up for Accidentally Green’s weekly e-mail newsletter that includes links to all the week’s posts and exclusive giveaway opportunities. Become a fan on Facebook. 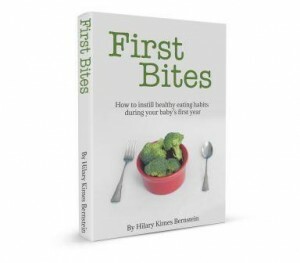 And learn about some easy and affordable ways to make healthy choices by reading my new eBook, Accidentally Green. How neat! I’m not a huge clothing shopper, mostly because it depresses me since having 2 babies in 2 year, but I find it totally therapeutic to browse stores like Target. I find some stellar deals, but probably don’t need to waste even that little bit of money on them. Thanks for making me think a bit more about my “bargain” shopping! Good for you! I have had the same issues in the past, justifying my purchases because I got a great deal. I think doing this would do me a world of good!! I didn’t last long on my clothing fast! I have lost a little weight (just a little) and toned up and I noticed my pants were sliding off of me. Of course, a pair of pants led to a few cheap t-shirts which led to a skirt. I’m a little better than I used to be, I think. It’s going to be an ongoing battle for me forever. 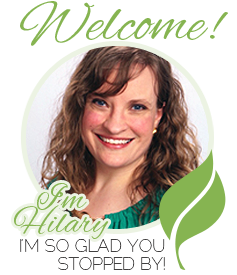 Thanks Hilary for your story! I am going through the same kind of no shopping idea. It is awesome to leave a store with cash still in my pocket!